My name has been an issue for me all of my life. My Mother told me that my name was not her first choice. She wanted to name me Elaine. When I was born, my Dad told the family that my name would most probably be Sandra (Sandy for short). I never actually heard how my parents worked this issue out, but there is no doubt that my Dad won. The fact that my Mom wanted another name for me, has affected how I felt about it. When I was a teenager, my Grandmother named her last dog Sandy (my grandmother was getting old and the dog was a sandy color), but still – really Grandma? Put these facts together and it is easy to understand why I have never liked my name. All my life, I wish I had a feminine. pretty name – any name other than the one I have. When I started to work professionally, I used my formal name, Sandra – somehow it sounded more qualified. But to most people, I am simply Sandy. Soon, I will celebrate another birthday – the day when my name was given. But before I was even born, God knew me and what my name would be. He knew the gifts and interests I would have. He created me to be able to talk to anyone about anything, to have a strong emotional intelligence and most of all He knew that I would be His. How interesting that Sandra means man’s helper. One of my strongest passions is using my gifts of discernment and care as a Biblical Life Coach. It appears that God knew that my name would fit me quite well. One more beloved gift from God, is that I now have a granddaughter named Elaina. I know that my Mom would be very pleased with her great granddaughter’s name!! 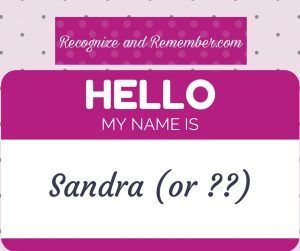 Sandra – Sandy – Snicklefritz (which is what my Dad did call me as a little girl) or my middle name (which my husband sometimes calls me) all that truly matters is that my name is known and engraved on the palm of my Savior. I completely understand how you feel about your name. I’m the same way. Not only is my name unusual (well, both names are unusual), my name was often joked about. In the 70’s when all the other girls (Becky, Jennifer, Donna, Angela) had fun bracelets with their names, I could never find one. I searched to no avail. To add difficulty to the name, I go by my middle name, and when I went to college, they would use my first name. It was a source of irritation for a while. In 50 years, I have only met one other girl with my name, and she spelled hers differently. ( I teach high school, and when my students get report cards, my first name is listed as the teacher, it’s amusing to see how long it take to figure out it’s me. ) I’ve grown to like my name…both names…and finally realize my name is as unique as me. We live in a small community, and when someone says my name, they usually mean me because there isn’t another with my name in the area. I know God has my name written in His hand, and I cherish that. Thank you for reminding me, especially on this Monday morning when everything seems to be going awry.